In September 2015 we returned to Caterpillar’s Visitor Centre in Desford to launch another new machine. After the success of the previous year’s event, Creative Agency, Collective Minds asked us to help them create another memorable launch and after party based on their brief. We were tasked with creating an immersive experience for the guests, including large format video, a kabuki reveal, and multi-layered light show, all timed to perfection. Having worked in the Visitor Centre before on previous events, our projects team were quickly able to put together a detailed quotation that reflected the need for excellence and reliability. The plan called for two 26m lengths of H30V truss to run the full length of the space, allowing for the show-stopping SGM LT-100 pixel tubes to also span the entire length. To facilitate washing the venue in UV light, our Elation Sixbars were also spread out along the length of the truss. To illuminate the stage and to create moving effects, a mixture of Elation Platinum Spot 5Rs and Clay Paky Mythos were used. This event was the first outing for our brand new EventBars, the powerful four-headed moving light fixture. They were ideal for lighting the centre pieces on the tables, as well as creating energetic beams during the reveal. Towards the middle of the room were two of our reliable 5.6K full HD Panasonic Projectors, and a hot head camera to capture the action and relay it live to other areas. We also supplied our brand new Atomos Samurai Blade video capture system in order to record footage from all cameras throughout the night. For a completely unique effect, we applied electro-luminescent (EL) wire along the edges of the two machines being launched. With the EL wire off, the machines were hidden behind the gauze, but as soon as it was switched on it created a hint of what was to come. The gauze itself was an integral part of the launch, as it acted as a translucent divide between the guests and the machines. With the fabric well-lit during the count down, our sound engineer was able to produce pulses of sound that would cause the cloth to visibly ripple, aided by the combined effectiveness of four L’Acoustics SB28 Subwoofers. With the addition of two haze machines, two low lying fog machines, and two strobes, the stage was set for the reveal to begin. During the countdown the large projection screen showed a specially created video, which was repeated around the room on some of our Panasonic 65” displays. As the content on the video intensified, so did the lighting, sound and special effects. Right on cue, our team perfectly synchronized the kabuki drop, the change to ultra-violet lighting and the sweeping effect of the 60 pixel tubes. 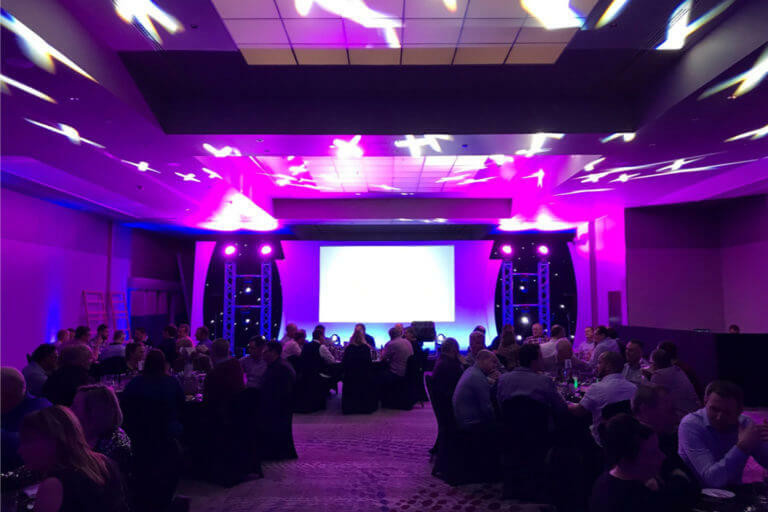 Shortly after the reveal and speech, the guests were encouraged to move to an upstairs space that we’d transformed into an after party, complete with DJ and nightclub lighting. We installed L’Acoustics 12XTs and SB18s to be able to guarantee consistent high quality sound for the entire room. Additional Elation Platinum Spot 5Rs and Sixbars created the high impact nightclub-style lighting that the client had wanted, aided by another haze machine. The event was a big success and feedback from Collective Minds was positive as usual.